Spend the day at Kings Dominion in Doswell, Virginia. Experience a world of fun and ride coasters like Twisted Timbers, Dominator, Intimidator305 and more! Also included is admission to Soak City Water Park, which is great for cooling off in those warm summer months! 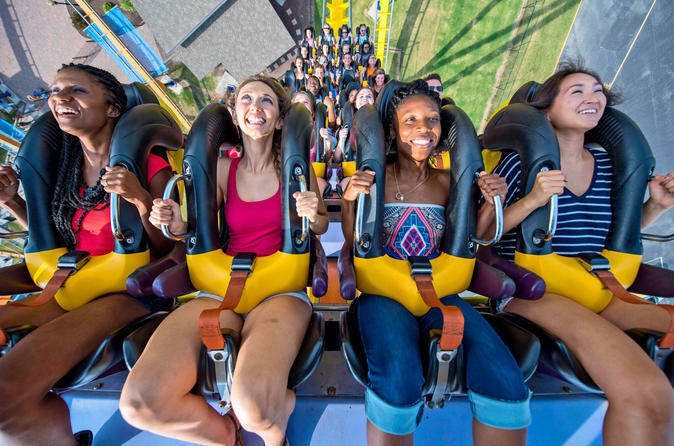 From some of the most thrilling roller coasters in the world to Planet Snoopy kids area and the regions premier water park, there’s fun for everyone in the family at Kings Dominion. Looking for an adrenaline rush? The collection of roller coasters features one of the tallest, fastest coasters on the east coast - Intimidator 305, which takes you up 305 feet and sends you plummeting at an angle of 80 degrees at 90 mph. And don't miss riding Twisted Timbers where wood and steel combine forces to bring you a one-of-a-kind hybrid coaster that will send you twisting through an experience that is impossible on a traditional wooden coaster! Looking for something that packs a little less punch? There are family coasters which are sure to delight even the smallest coaster lovers. Children can take their first coaster rides on the Great Pumpkin Coaster or Woodstock’s Express before making their way up to the bigger rides. Challenge your family to a lap on Dodgem or take on the evil Boocifer on Boo Blasters on Boo Hill. For the smaller visitors, the 14-acre children’s area, Planet Snoopy features 20 family rides, numerous kids activities, live entertainment and more. Kids can take a lap on the PEANUTS 500, bounce up and catch Charlie Brown’s kite in the Kite Eating Tree or take flight on Sally’s Sea Plane. When you need a break from the rides, head to one of the show venues and catch some live, world-class entertainment. The PEANUTS gang puts on a great show at the PEANUTS Playhouse in Planet Snoopy. Be on the lookout for the PEANUTS Party People and participate in their fun family activities. The Clown Band is always roaming around with their shenanigans – throw on your dancing shoes as they get down to their high energy music. Spending the day riding some of the tallest and fastest rides and roller coasters on the planet can work up an appetite. Whether you crave cotton candy, fresh cut French Fries, gluten-free options or you prefer sit-down dining in a relaxed atmosphere, there is sure to be something for every taste. Also included in your admission ticket is entry to Soak City Waterpark (open seasonally), where you can swim, slide and splash your way through 14 water slides, two wave pools, rushing rivers, relaxing lagoons and kids' play areas. This is the ultimate place for families to catch some rays. Open select dates during summer (open late May to early September).